Having explored how humans have come to use the drugs we do today, how then might we envisage a world of the future and possible relationships with psychoactive drugs? Biology tells us that each of us are born to use drugs. Not necessarily to take them, but perfectly evolved to use and metabolise them for a wide variety of purposes and effects. History charts our long partnership with mind and body altering substances. A history shaped by availability, social perceptions of drugs and the effects they have and societal constraints on how they are used. A history written by the technological advances which shape the drugs we take and how we get them, and the social and economic forces which drive us to use them, and in turn are driven by our insatiable appetite to alter our perceptions. 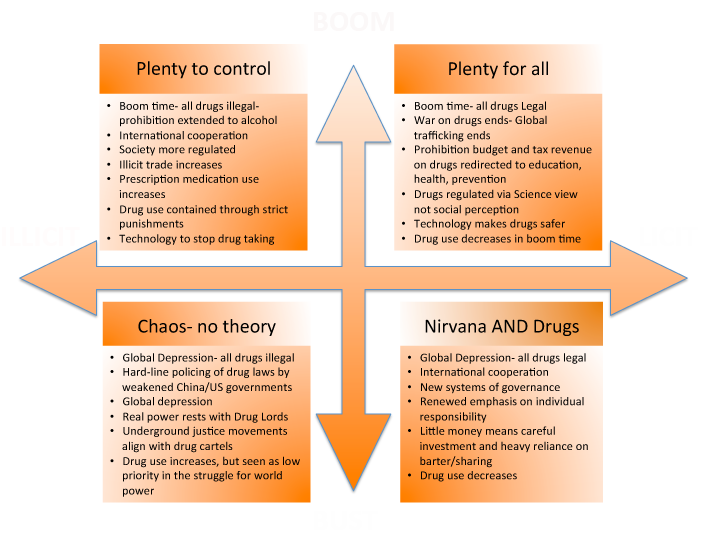 Having identified the forces which affect and drive our drug use, and having explored a snapshot of our current habits, we thought we’d venture forward another 40 or 50 years, and see what things might look like. Let’s call it the benefit of foresight. Ours is a study of macrohistory, a study of humans and psychoactive drugs, specifically alcohol and cocaine, since the dawn of human history. From this perspective, we can identify long term trends and patterns. Our perception of these patterns is that the way we use drugs, as societies and as individuals, mirrors the action of a pendulum, swinging from one extreme to another, but always trying to find its way to the centre of the arc, to rest, albeit precariously, in the place of moderation. 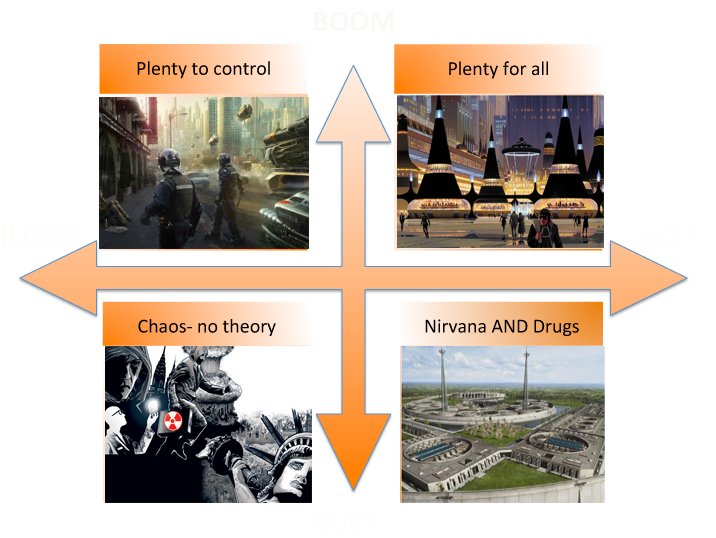 That in mind, we have chosen to describe four future worlds, each being influenced by this universal driving tendency to use psychoactive drugs and to find moderation, but driven by different economic forces and environments of different regulation regimes. 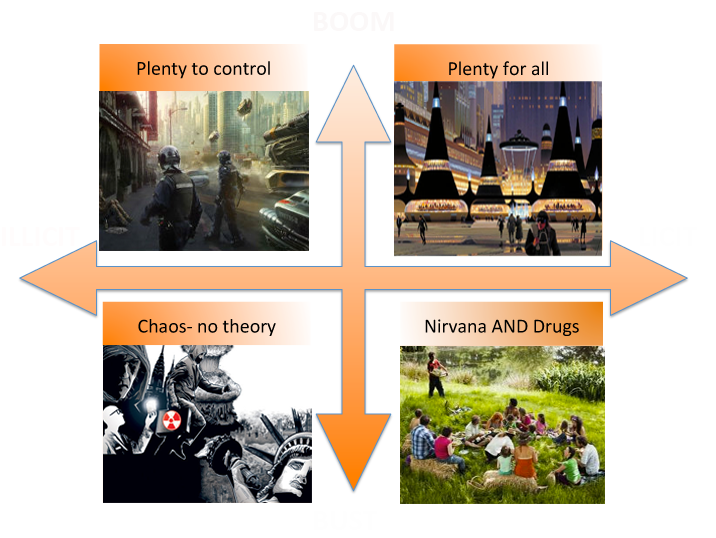 In each of these different scenarios, the other forces we know to drive drug use come in to play according to the circumstances of our imagined future worlds. The process of scenario building is based on the fact that none of us knows how the future will play out, but we have some clues to possible directions, as every future has a foot in the present and holds up some mirrors to the past. By looking at several different plausible futures, we can see our ideas and strategies come to life in a distinct future world in which we may one day find ourselves. This is the creative part of our study, the bit where we construct a matrix of constraint, define our worlds of the future then take some poetic licence as it unfolds. It is very pleasurable to solve climate change in a single sentence, yet unnerving to unleash a whole new illicit trade or an anti-drug army on an unsuspecting future world. These scenarios are not intended as a prediction for the future. Rather, they are intended to serve as a vehicle to spark thought and discussion of how things might play out given the set of real constraints that are known to act in a world where drugs and humans are inextricably intertwined. It may give us more insight into aspects of the here and now, and help us to recognise the forces that mould our future as they appear.